This is the third and final meal for my Valentine’s Day Menus. This is one of my go-to recipes all year round because it’s fairly simple but so flavorful and a nice change of pace. It’s also really easy to multiply this recipe and cook for a lot of people… I actually served this meal for Christmas at our house a couple years ago. 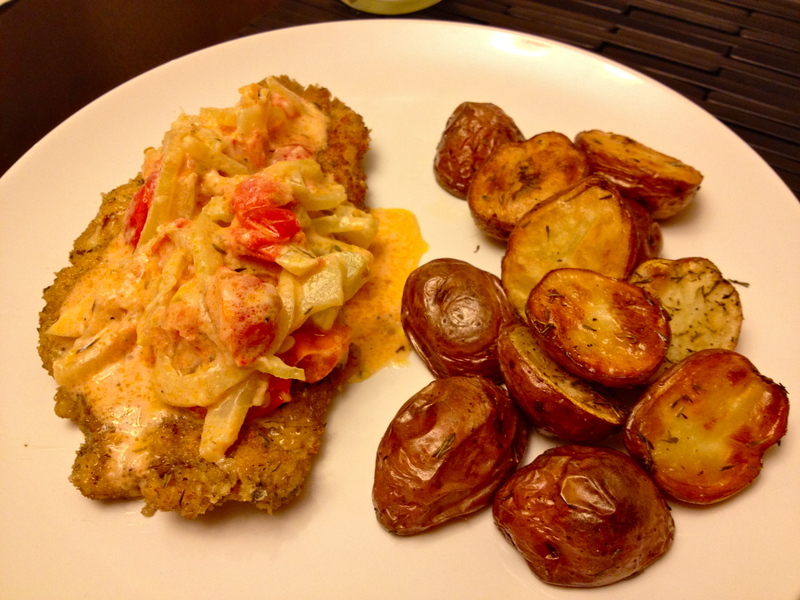 Chicken breasts pounded into super thin cutlets, breaded in hand-seasoned breadcrumbs topped with a creamy tomato fennel sauce with roasted red potatoes on the side… this menu is sure to please! Preheat your oven to 375 degrees and take out a baking sheet. 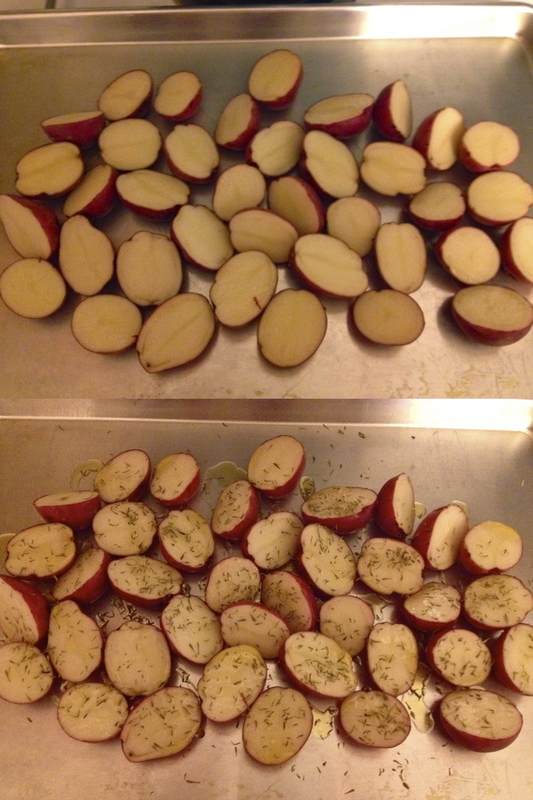 Cut your red potatoes in half (or in quarters depending on their size) and lay them cut side up on the baking sheet in a single layer. Drizzle with olive oil and sprinkle a little salt, pepper, dried basil and time over top. These will roast for about 45 minutes (you can turn them about half way through if you want, although you don’t have to) so I just start them and by the time I’m done with everything else they are usually ready to go. Place a cast iron skillet over medium heat and add enough vegetable oil to come up about 1/4 inch on your pan. 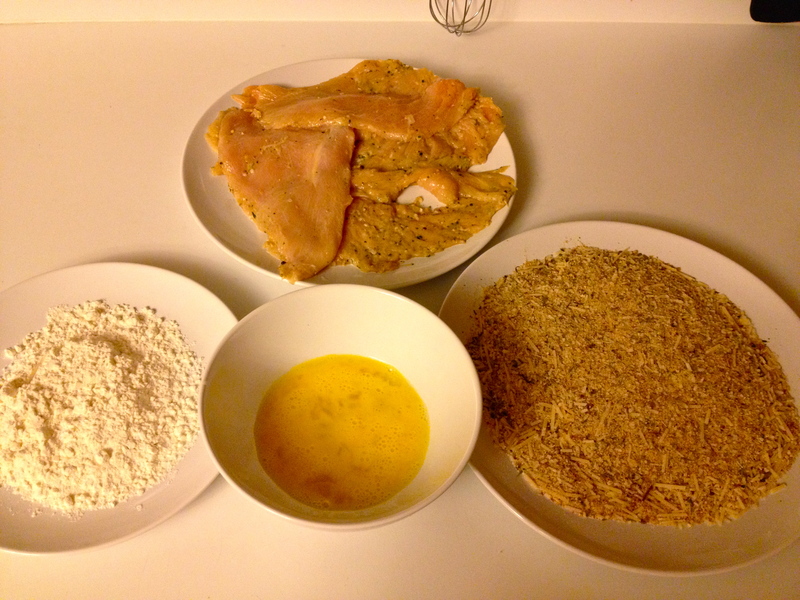 Cut each chicken breast in half, making four cutlets total. Place each cutlet under a piece of plastic wrap and pound out using either a mallet or a heavy bottomed pan. Season them with salt and pepper on both sides. Next, set up a breading station. Put some flour on a small plate and beat one egg in a small bowl. Put a cup of breadcrumbs on a small plate and then add the parmesan cheese and 2 tsp each of the basil and thyme. Toss with a fork to combine. Using one cutlet at a time, dredge through the flour, then the egg and finally coat with the breadcrumbs. Place the breaded cutlets on a plate. Cut off a very small piece of one of the cutlets to test your oil. You want to make sure the oil is hot enough before you put your cutlets in, other wise the oil will saturate the chicken and it will be greasy instead of crispy. Once you’re sure the oil is at the right temperature, add two of the cutlets to your skillet. Cook until golden brown on the bottom, about 3 minutes and then turn over and cook 3 minutes more. Once golden brown on both sides, remove from the skillet, place on a paper towel-lined plate and repeat with the remaining two cutlets. At this point, the potatoes are pretty close to done so I put a baking rack flat on top of a baking sheet and put the chicken on that. I throw the chicken in the oven with the potatoes still in it and just turn the oven off. This will keep the chicken and potatoes hot while I make the sauce. In a high-sided skillet over medium heat, I strain in the leftover vegetable oil that I fried the chicken in and add a tbsp of olive oil. Add in the fennel and cook for 5 minutes until slightly softened. Stir in the garlic and a pinch of dried thyme. 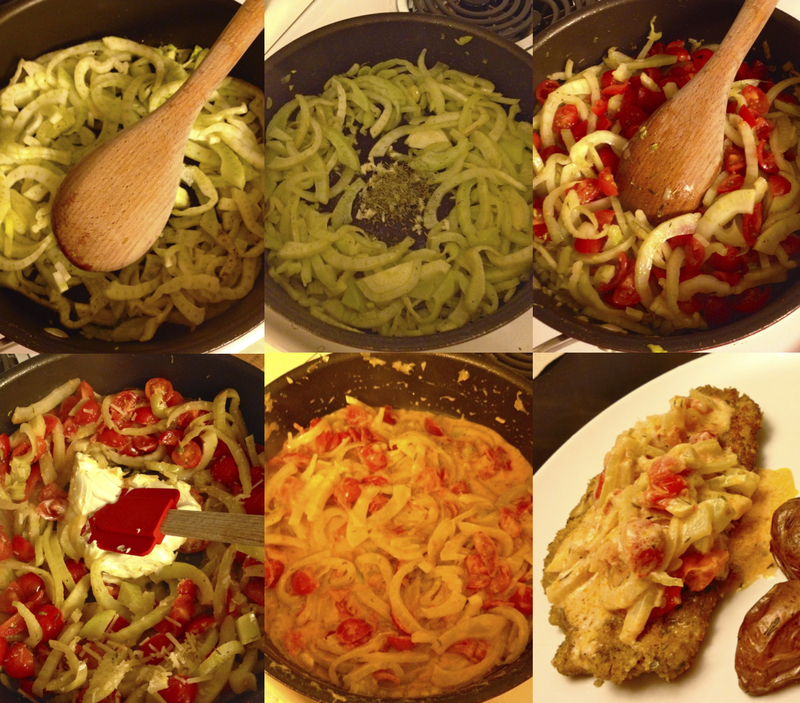 Add in the tomatoes and cook for 5 minutes more. Add in the mascarpone cheese and stir until creamy. Serve the chicken cutlets topped with the sauce and the roasted potatoes on the side. Hope that every one has a love-filled Valentine’s Day and that you all eat well!